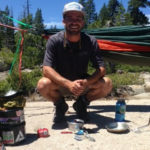 College students know how to stretch a dollar, which is exactly why we met up with Richard Orth from BakPocket Hammocks. Rich is an entrepreneur, college student, and avid outdoorsman who is adamant about eating good food in the backcountry. According to Rich, “just because you’re on a budget, doesn’t mean you have to compromise taste and comfort when camping”. We agree, which is why we’re brining you Richard’s top 3 tips for camping on a budget. Cook meals with cheap, versatile ingredients. The cost of a hammock is significantly lower than most lightweight tents. 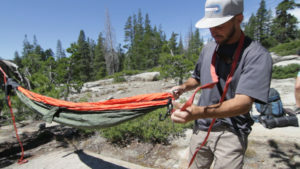 Lightweight hammocks from BakPocket cost $78, compared to a NorthFace one person tent which will run you $129. Another benefit to a hammock is they get you off the ground, which means you save money on a pad, and stay warmer than you would on a cold floor. If you’re worried about being in a place without trees, Richard recommends using climbing nuts and carabiners in rock cracks to support your hammock line. 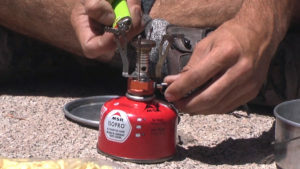 Believe it or not, this Ultralight Backpacking Stove is only $6.31, and it has a lot of great reviews from happy customers. Add an MSR IsoPro fuel canister for $4.95 and a lightweight pot for $10.99, and you’re entire cooking setup will cost only $22.25!! 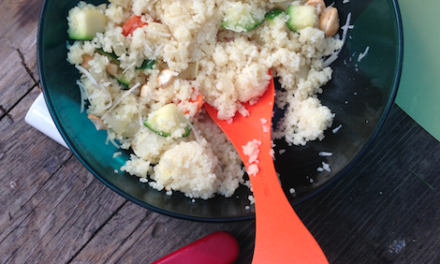 Save money on trail meals with cheap, versatile ingredients. Dietary staples such as cheese, pasta, rice, dehydrated fruits, jerky, salami, ect…are great examples of versatile ingredients. Check sale racks and bins for marked down foods to find the best deals. A lot of common sale items such as pasta, rice, sauces, seasoning, and seasonal products are great for backpacking. If you have a trip coming up, stock up if you find a good deal. Saving money on food is all about finding ingredients that can be purchased in bulk and used for several meals. Richard used 1/4 block of cream cheese to make his Pesto Tortellini. Then he used the leftover cheese on bagels for breakfast, on crackers for a snack, and with cocoa powder for a creamy dessert. He spent $2.24 on cream cheese, which he will end up using for 5 different meals. In total Rich spent $9.83 on his 4 serving Pesto Tortellini, which comes out to $2.45 person. 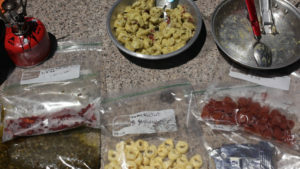 This affordable backcountry meal was invented by Rich Orth, because even though he's out roughing it, he still likes to eat good food. Cream cheese is of Rich's favorite backcountry ingredients because it last for many days without refrigeration and it can be use on or in many different recipes. (Store pesto and cream cheese into plastic bags for lighter travel). Cover hole to protect from creatures invading your strained water. Cut cream cheese into small squares, and add to tortellini. Next add pesto, stir until creamy and ingredients are all mixed together. Feel free to "beef up" your tortellini by adding salami, pepperoni, sun dried tomato.....have fun with it! When you're done eating, be sure to clean eating and cooking area, and always leave no trace!